Story follows a young woman in occupied France who finds herself falling in love with a German officer during WW II. 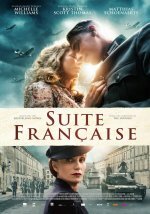 A spirited young woman in occupied France falls for a German officer and must choose between love and her country. Left under the supervision of her domineering mother-in-law when the husband she never really loved heads off to war, the young woman's only escape is playing the piano. A young German officer assigned to stay at their home is a former composer, and the attraction between him and the young woman is immediate.